Product prices and availability are accurate as of 2019-03-25 20:27:04 EDT and are subject to change. Any price and availability information displayed on http://www.amazon.com/ at the time of purchase will apply to the purchase of this product. As a discerning mom, you know your baby deserve the best. Every baby deserves to be dry and clean and every mom deserves to have as small a mess to clean up as possible. To do that, you need to know which diapers are best for your baby. That's why we've put together this collection of the best eco friendly disposable diapers out there.Each disposable diaper variety pack comes with 8 different brands of diapers, 3 diapers per brand, for a total of 24 diapers. The pack also includes a diaper rating sheet to help you remember which diapers you liked best. The following diaper brands are included in the Perfectly Picked Going Green Box: Earth's Best, Huggies Pure & Natural, Seventh Generation Free & Clear, Naty by Nature Babycare, Andy Pandy, Honest Diapers, Eco Attitude, Nurtured by NatureNeed a gift for a new baby boy or girl? Searching for baby shower gift ideas for unique baby gifts is hard , we make it easy with this one of a kind diaper samples pack. It's perfect for baby shower gifts, christening gifts, baptism gifts, new baby gift baskets, or diaper cakes.You want to be environmentally friendly, but eco friendly baby products are hard to come by, and they aren't all of the same quality. 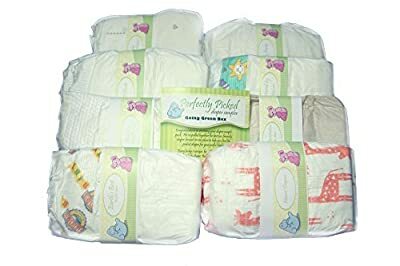 Organic diapers, green diapers, natural diapers, biodegradable diapers, there are a too many to choose from and it would cost a lot to try all the organic disposable diapers out there. 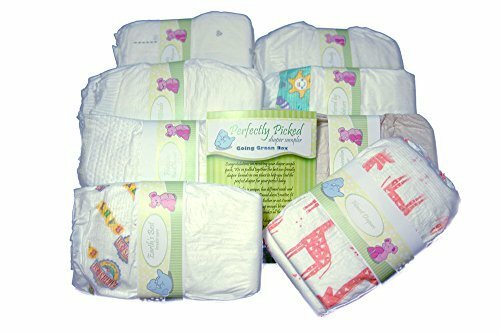 This eco-friendly diaper sampler kit allows you get a sample of the best organic diapers out there to find the best diaper for your baby, and the best choice that will help future generations as well.If you'd like to try more of the best diaper brands, make sure to check out our Perfectly Picked Best Brands Box, available here on Amazon.